Captain James B. Armstrong founded the Armstrong Ranch around 1893. In 1904 the St. Louis, Brownsville and Mexico Railroad came through and added the ranch to its stops. The railroad sold out to the larger Missouri Pacific. 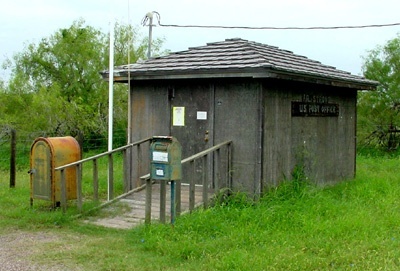 The first post office operated under the name of Katherine, but was renamed in 1915. 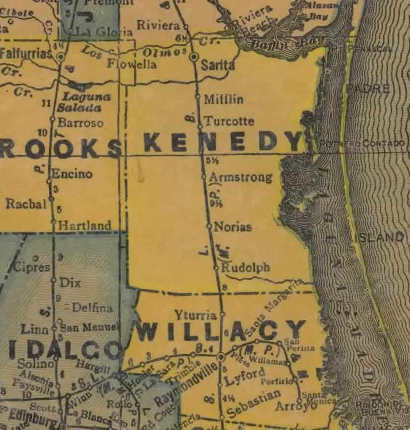 The highest population occurred in 1929 at 25 persons, although when a bus from the Rio Grange Valley occasionally breaks down near Armstrong the population temporarily swells to 40 or more. Amenities are few and it's hard to see where Armstrong's 20 estimated residents actually live. 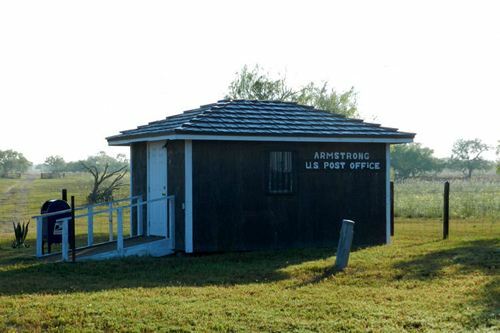 We include tiny Armstrong in our town pages for two main reasons: One, people have asked if the post office is for real, and two, there's not a lot of other towns to write about in Kenedy County. "Major James B. Durst purchased the Armstrong Ranch land in 1853. His daughter married the Texas Ranger Capt. John B. Armstrong in 1878, and they moved their family to the property in 1882. Their descendants continue to run the ranch today. In 1904 the St. Louis, Brownsville and Mexico Railroad came through and added the ranch to its stops. The railroad sold out to the larger Missouri Pacific. The first post office operated under the name of Katherine, but was renamed in 1915.